to create and advance scientific data. 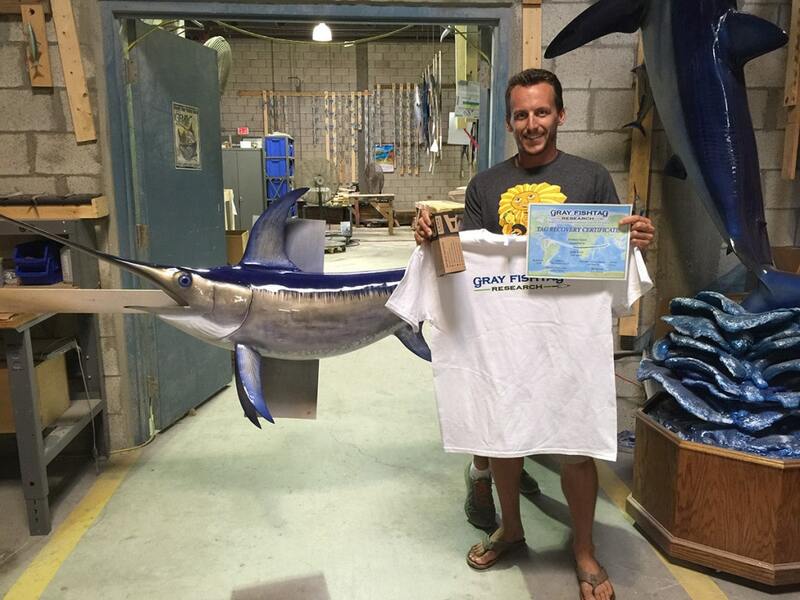 The Swordfish (Xiphias gladius) named “Little Scott” (Tag ID: GFR2411) was originally tagged & released by angler Scott Dingle on July 7th, 2015 while fishing with Captain Nick Stanczyk and mate Hunter Barron aboard the charter boat Catch 22 out of Bud N’ Mary’s Marina in Islamorada, Florida Keys. “The swordfish was just about keeper size, so we decided to tag and release it for somebody else to catch in the future”, said Capt. Stanczyk. 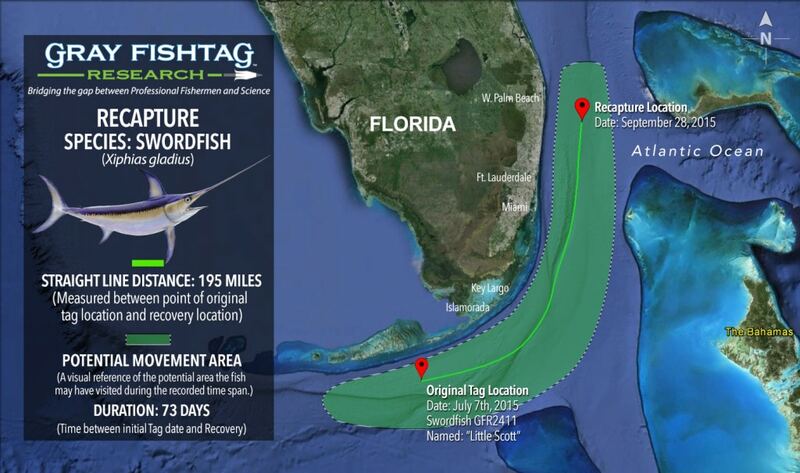 The Swordfish was recaptured approximately 195 miles north of the original tagging location on September 28th, 2015 by Captain Jackson Coate while fishing aboard his boat F/V The General. The swordfish was at liberty in the water for 73 days until its recapture. Captain Coate, a commercial fishermen, recaptured the Swordfish approximately 22 miles off the coast of southeast, Florida while swordfish buoy gear fishing at night. This Swordfish tag recovery highlights an important partnership and collaborative effort between professional and commercial fishermen. The Swordfish was originally tagged and registered by anglers with a charter fishing boat and subsequently recaptured and reported to Gray FishTag by a commercial fishermen. Collaborative fisheries science in action!! The Catch 22 charter boat crew will receive some Gray FishTag gear for their tagging efforts. Commercial fishermen, Captain Jackson Coate, will receive a pair of Costa Del Mar sunglasses, a Tag & Recovery Certificate, and Gray FishTag gear for reporting the tag recovery. The tagging and research efforts is made possible by our research centers and sponsors AFTCO, AA Video, American Fishing Wire, FECOP, Blackfin Rods, Mold Craft, Costa Del Mar, CR Primo Fishing Tackle, Shadow Graphics, Grande Alaska Lodge, Marina Pez Vela, Los Suènos Marina and Resort, and The Zancudo Lodge.